I am trying to straighten up my garage and get my tools consolidated and come up with some space saving workspace. Since I keep my boat in the garage (23' Stingray cuddy) and my tractor ( John Deere 3320 with Backhoe and Front End Loader) space is at a premium and I just have to get rid of the bench where I currently keep my stuff. So I decided I wanted a nice stand up tool box set, of course Snap-On was out of the question, I don't want to spend 5 grand on a box and to be completely honest Craftsman's boxes do not impress me (not even the "pro" lines) so I was looking around and I just happened to find myself walking around lowes getting some other stuff and I stopped into the mechanics tool section. 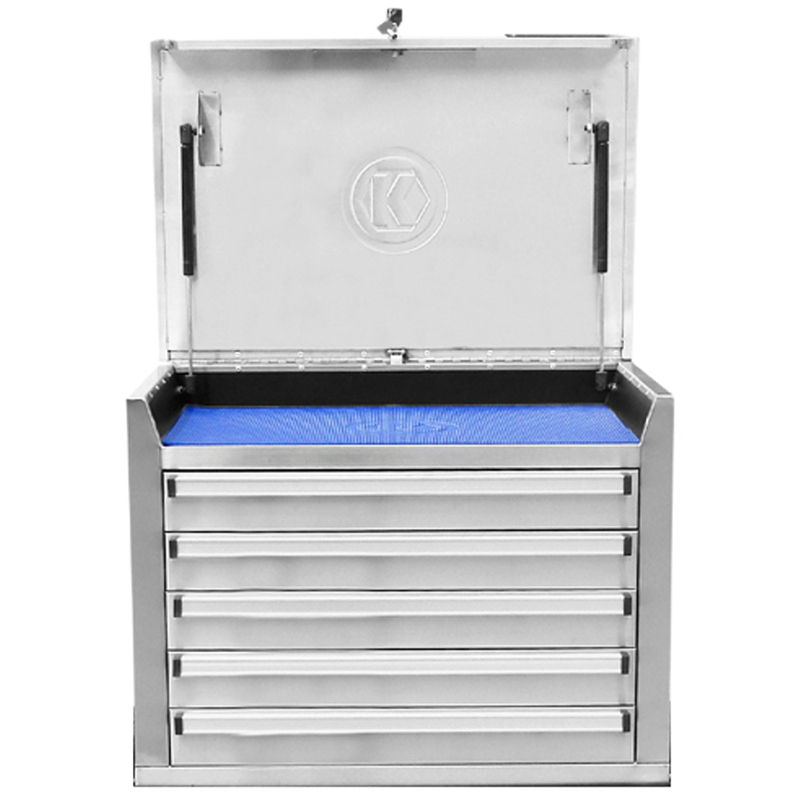 They carry Kobalt brand tools, which seem to be fairly well made, so I checked out the tool boxes and well I brought one home! I paid $379/$279 for the stack, they have HEAVY duty ball bearing drawers, massive wheels with grease zerks, brakes on both steering wheels, all stainless steel outer finish, all drawers come with liners the set even comes with a padded cover to keep the box clean when not in use. Honestly, if you want a nice set at a reasonable price you may want to give them a look. But be forewarned, I used my front end loader to get them out of the back of the truck.... They are HEAVY! quality bears, wheels and hinges can't make up that difference. I think half of it is "collectability" Snap-On offers all the neat collectible boxes like the Corvette Anniversary Editions and the Harley Editions and stuff like that. Because of that, you pay for it.. But then again, nothing Snap-On makes is remotely cheap. His logic is, sure Craftsman has a lifetime guarentee, but a lot of good that does you when you are in the middle of working on something and it breaks and you have to drive 30 miles to get it replaced and the Snap-On or Mac (he has both) doesn't break. Craftsman isn't the same as it used to be either, thier newer tools are not as well made as they were even 10 years ago. I have a brand new Craftsman bottom stack tool box downstairs, granted it cost no where near what the Kobalt boxes cost, it's also very shoddily built. 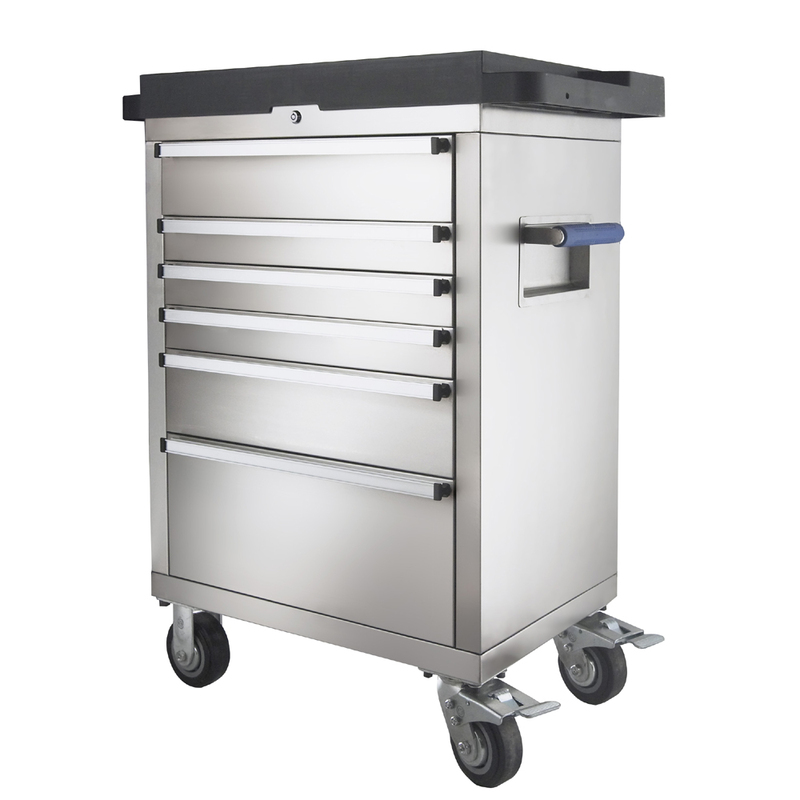 That's why I passed on the Craftsman Pro boxes, I could have spent a grand and not gotten the same quality (these drawers feel like Snap-On quality when you open and close them, they are very well built). I also like the SS finish, no chipped paint to worry about and easy cleanup. Those tools are no even close to the quility that they were. My guess is that that Kobalt box will last a long time. Their wrenches impressed me but I don't own any to date. I like all Craftsmans hand tools....but will have Snap on ratchets. They are smooooooth. My best friend has a big Kenedy double stack (uses it in machine shops) it's a well built box for sure. he was VERY impressed with this Kobalt box. And I agree with you Craftsman has gone way down hill. A friend of my Dads used to work for Craftsman back in the 70's. I remember one evening when he was at our house and my Dad asked him how Craftsman can afford to do the Lifetime warranty on their tools? George replied, "It's a lot cheaper to replace it than it it is to build one that won't break." And I hate to say this, but it seems like ever since they started having Bob Vila endorse the product on infomercials the products got way chintzy. Like the Robogrip pliers or whatever they were called, "Laminated construction is stronger than a solid piece of steel" well yeah sure, in a perfect world.... The first time I used a set, the rivits holding the laminated plates together broke and they fell apart. My Dad used to professionally drag race and run his own speed shop and also had a regular garage. When we decided to move to FL years ago, he got rid of most of the tools and equipment dirt cheap.... Now I wish they were still around! At least I have most of his SK Wayne stuff (which was a fantastic brand decades ago). SK and Proto are still good. Armstrong is rock solid as well. They're less $$ than the Mac or Snap On stuff but won't let you down at the worst possible moment. I forgot to add,,, the Snap and Mac stuff is dealer supplied to you. Nice if you work with the stuff day in and day out and the tool truck swings into the yard and you buy as you need or new things come out, like daily. Financing goes with it if needed. I have very little of the tooling from them but my ring compressor, 4:1 torque multiplier, and a T-10 driver from 1979 are still great. Nothing is going to out price the Sears stuff or the availability of it. It's good stuff if your not beating on it every day. The screw drivers of the last 10 years or so have been left out of the heat treating stage. Soft as puppy chit in a rain storm. The thing IMO that hurt them most was loosing the quick release patent or what ever it was that stopped production. I still have a 1/4 and 1/2 drive fine tooth ratchet set and wish I have the 3/8. The replacement of today and the last several years bites on it and as such I just stay away. It's great for homeowners and light duty use. As for "Bobber Villa" I have zero use for the man but that's another thread. Anyone have a good solution for organizing the drawers for sockets & wrenches ? I was a at Sears today & didn't like their stuff. Also, how do you keep wrenches & sockets organized on the boat (in a toolbox) ? On the boat I have an Allied toolset it has "good enough" tools for light use or use in an emergency and has plenty of tools in the box, wrenches, sockets, wire strippers, test light, electrical tape you name it and it was under $60 from what I recall, and all the tools snap into the rotomolded polyeythene case. I bought some socket organizers from Gemplers. They were made by Hansen Global Inc. http://www.hansenglobalinc.com They come in 3/8 and 1/2 inch drive. Also listed in metric and SAE. Standard and deep fit on the same tray. All my other stuff is just laying in the drawers. I'll find it. I just wnt there. They make some cool stuff. View Next Unread Camcorders ???? ?